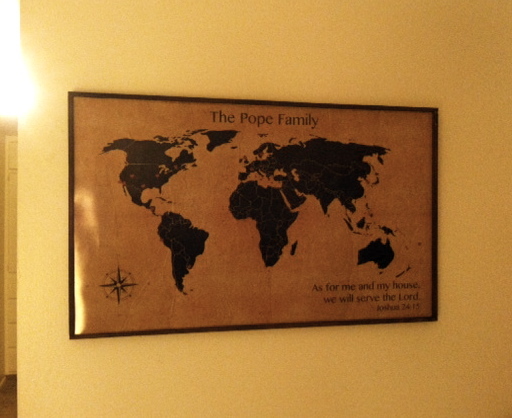 This year for Christmas, we made our Grandma Pope a missionary map. This map shows where her children and grandchildren have served their missions. Matt designed the map in Photoshop and then we had it developed at Sam's Club. First, we sprayed some spray adhesive to the back of the map and then smoothed the map on the front of a piece of plywood that we cut to the size of the map. Next, we cut and painted some boards that will frame the map. After the paint was dry, we nailed the boards to the plywood. With my Cricut, I cut some small hearts out of red vinyl to mark the places our family members have served their LDS missions. Our newest missionary cousin got to put her own vinyl heart on the map after opening her Mission Call. She is called to serve in Seoul, South Korea and will be leaving in May. I found the original idea for this HERE. That is so cool!! I bet she cried! I can't think of a neater gift to receive. Only from the ever handy Pope craft corner too.